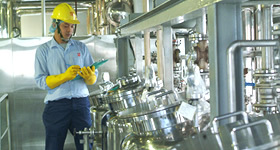 Contract Manufacturing for synthesis products in compliance with GMP requirements. Provide manufacturing operations support across operating units and product lines. Participate in technology transfer and scale-up activities. Pilot lab equipped with three 20 -liter and one 600 -liter fermentors for scale-up study and process validation.